OUR SURVIVAL GUIDE TO BRIDAL/WEDDING SHOW SEASON. NOW YOU’VE GONE TO AT LEAST ONE WEDDING/BRIDAL SHOW, AND YES THERE ARE MANY MORE HAPPENING THIS TIME OF YEAR. 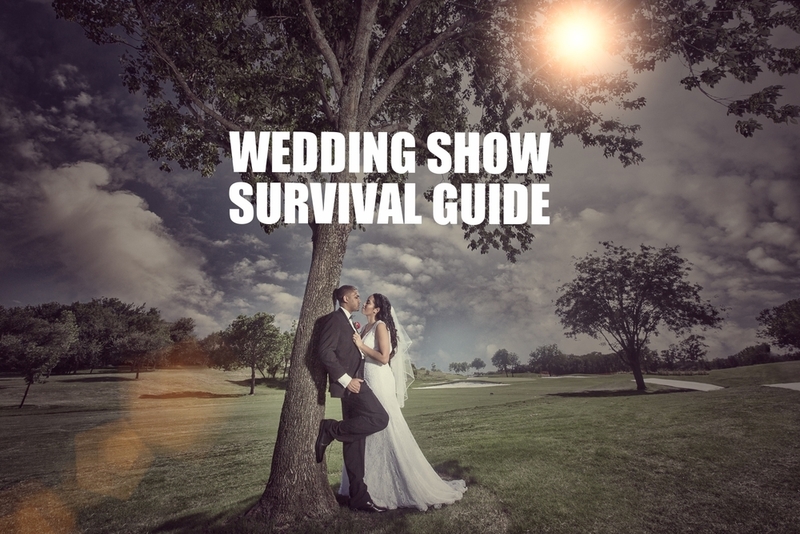 SO TO MAKE THINGS A LITTLE EASIER FOR YOU, WE ARE ARMING YOU WITH OUR WEDDING SHOW SURVIVAL GUIDE. HOPE YOU HAVE PEN AND PAPER HANDY; YOU MIGHT NEED THEM. You want to make sure before anything that you write down everything you think you will need for your wedding. Now that you have a list, start numbering them in order of the most important to the things you could do without if needed. For example, the venues, for both your ceremony and the reception, and the wedding photographer should be at the top of your priority list. Venues typically book at least 1-2 years in advance, so finding that perfect place needs to be first. Close your eyes and picture your dream wedding, then jot down some key features you are wanting for your wedding location. The next on your list should be the photographer. Wedding photographers are another vendor that usually book 1-2 years in advance. Make sure you find an artist whose work you love and personality you enjoy. You be spending a lot of time with your photographer, and the photos in your wedding album are your first family heirloom that tells how your story together began. Now that you have your priority list written, and ideas in hand, it’s time to create a game plan. Who do you want to take with you to the wedding shows? Pick a team of people that you trust, and that are going to support you and your decisions. Decide if you want to walk around together checking out each booth, or if you’d rather take the divide and conquer approach. Make sure you stick to your list. It’s so easy to get distracted by delicious food and beautiful flowers while you’re walking around. Just make a mental note, or add it to the list to go back and spend a little more time at the other booths later. Once you are able to knock a couple things off your list, you’ll feel better and have more time for the fun details. Shows are usually 5-6 hours long, so there’s plenty of time to walk around and see everything. There’s also numerous vendors, so it’s easy to get over whelmed. Just time your time. It’s ok to step back for a few minutes, and take a breather. This is why having a good support team with you is handy. Let you mom or best friend do a little talking to vendors, and help you filter out the ones who don’t offer what you’re looking for. There’s going to be a lot of opportunities to sign up for different giveaways and prizes. Try to have labels, stickers or a stamp ready, so you don’t end up with hand craps or soreness later. Plus it makes it easier for the vendor to get the spelling correct on important details like your name and email. Make sure to add your name, wedding date, email and even wedding city to your labels. These are typical details that vendors will ask you when you enter to win a prize. Other thing to be prepared for is show specials. Many times a vendor will have a special going on during the hours of the show only, so you’ll want to find out what those specials are. Sometimes they can be a discount or a free upgrade if you book that day. Make sure you find out what is required, and don’t be afraid to ask for details. Now that the show is over, and you have a bag of goodies, spread you info packets and flyers out on the floor or a table. This will allow you to see everything and sort info into piles or groups of vendors. As you are going through, set aside the vendors you connected with the most. These are the ones that you will want to look up online. Check for their reviews, their website, and their social media. Reach out to them and set up a personal consultation to learn more about them and their services. Once you have your heart set on a vendor, book them! Nothing makes a vendor happier than hearing you love them, and you want them to be a part of your special day. Plus that will be one thing you can mark off your list.